You can come to the farm, pick up a basket, and fill it with your choice of the produce we’re currently growing. Look at On Farm CSA Shares for more information, then contact us to sign up! We’re signed up this year for the Noblesville Main Street Farmers Market and the Carmel Farmers Market. Both markets start May 7th. It’s hard to predict the weather in March and April, but we’re off to a fine start and should have a good selection of leafy greens and some root crops like turnips, radishes, and/or carrots when the market starts. 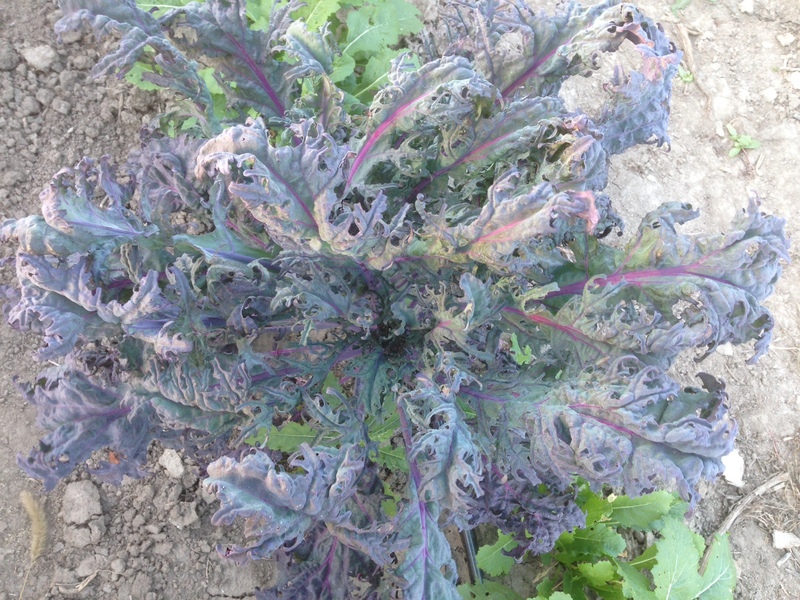 Maybe even some purple kohlrabi! We also carry various garden plant starts throughout May. We’ll be back at Indy Winter Farmers Market on March 26th. 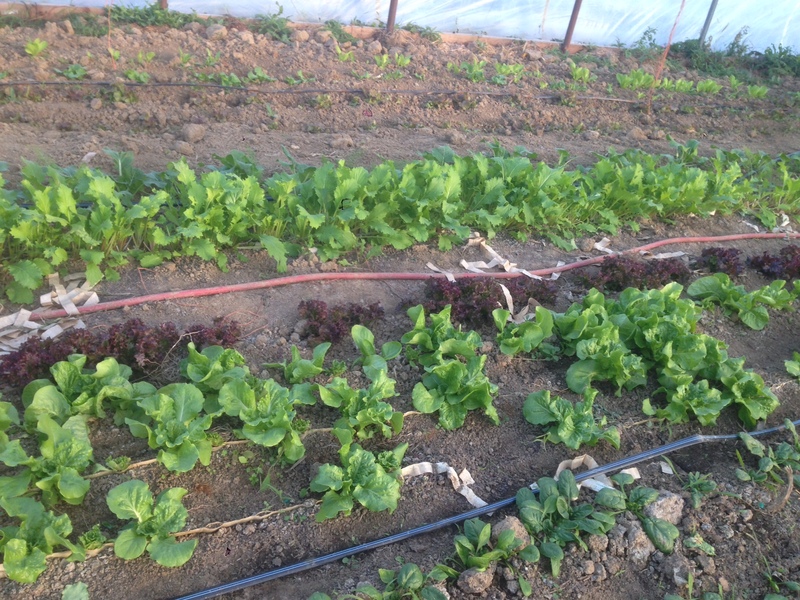 Our appearances there throughout April will depend on how the weather is treating the salad greens and how much progress we’re making on spring planting. The number one question we’re anticipating on May 7th is WHEN WILL YOU HAVE TOMATOES? Those growers who burn natural gas, wood, or a lot of coal may have them in May. We rely on sunlight and a sheet or two of plastic placed over a big frame, so our tomato crop starts coming in from mid-June through early July. The outdoor field tomatoes are mid-July and later. The winter has been challenging, but good. 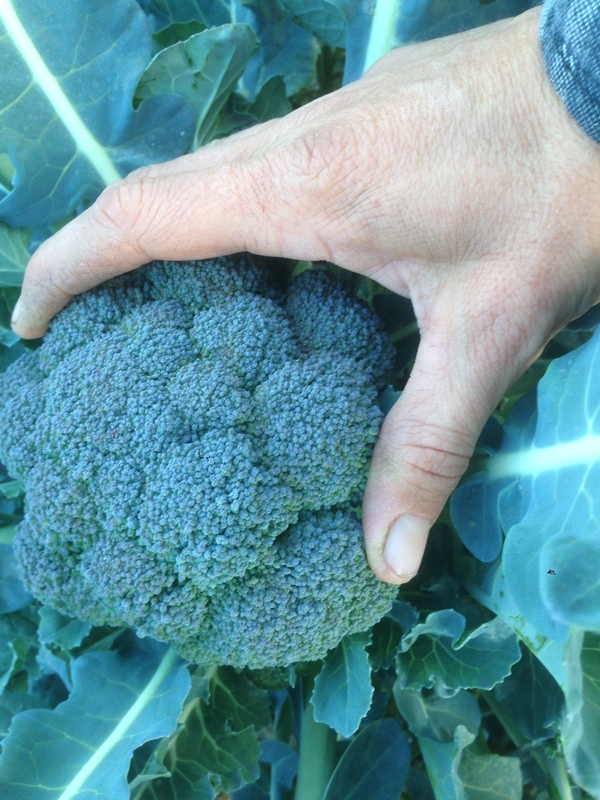 We are using low tunnels for late fall, winter, and early spring production. A couple of design improvements throughout the process have us optimistic. We’ll be planting a windbreak of trees and a few hundred asparagus plants. Both are signs of our optimism for future seasons. We received a nice write up this month in Farm Indiana. Check it out! You can find us this winter at Carmel Winter Market and Indy Winter Farmers Market. We’ve got brussels sprouts, romanesco, broccoli, spinach, lettuce mix, rainbow carrots, beets, salad turnips, giant sweet kohlrabi, and lots more. Many things went well in 2014. We grew and sold more produce than ever. The weather was cool and rainy, but we missed out on the flooding and terrible storms that plagued other parts of the state. One thing that didn’t go as wonderfully as planned was our greenhouse tomato program. We grew and sold more tomatoes than ever, but I wasn’t happy with the flavor. Even our outdoor field tomatoes were just “okay,” probably due to the cool temperatures and rain. It was clear to me, however, that many people just want a round, red tomato and don’t care as much about the flavor as I do. As much as I would explain repeatedly to a customer that the best tasting tomatoes were cracked on top, or were brown, purple, green, or striped, they would fixate on and purchase the perfectly smooth, red, round, and not-very-tasty greenhouse varieties. Geronimo tasted better than Florida 91, and was easier to trellis due to its indeterminate habit, but neither variety impressed me with flavor. In an effort to provide something for everyone this year, we’re going to grow grafted Big Beef in the greenhouses. The seeds are cheaper, the tomatoes will be bigger, and Big Beef is a popular variety for a reason – it hasn’t had all the flavor bred out of it. I don’t think it is as firm or as heat tolerant as the Florida 91s, but surely it will taste better. I’m going to plant my remaining Florida 91s in the field as a hedge against a hot summer. We’ll also put some heirlooms back in the greenhouse- Eva Purple Ball, Cherokee Purple, and Mark Twain (he claimed not to like tomatoes, but they named one after him anyway). And we’re going to have 4 types of cherry tomatoes in the greenhouse for rainbow quarts early in the season. I chose Eva Purple Ball because it’s been one of the most productive outdoor tomatoes on our farm several years running. Striped Cavern sets more fruit, but is only good eating when it’s baked and stuffed. Opalka sets a ton of fruit too, but gets blossom end rot and always has green, cracked shoulders. (I forgive Opalka, because it tastes good enough to be worth the bother.) Eva Purple Ball has perfect pink spheres, no cracks, and sets fruit in big clusters. I can’t wait to see what it does on top of a nice disease resistant, vigorous rootstock. Cherokee Purple is so universally beloved by those who like heirloom tomatoes that it was the first, most obvious choice for a greenhouse heirloom, even though it is not a super productive variety. Mark Twain was chosen because it’s round and red AND is supposed to taste good. Our lineup of tomato plants will be similar to other years, with the addition of Weisnicht’s Ukranian and Indigo Cherry Drops. Many seed catalogs have descriptions that exaggerate badly, but I’ve found Fedco’s descriptions to be quite accurate, so I went ahead and got some seed. In non-tomato news, I have green onions and leeks in our summer field crop plan for the first time in a few years. Our ginger supplier has no seed this year, freeing up about 800 square feet of greenhouse space. This means more greens when the Carmel Farmers Market starts up in May. We added about 600 more feet of strawberries in the fall, and 100 raspberry plants will be joining them in April. Neither are expected to bear a crop until 2016. Rhubarb is on the seed schedule too, with a small crop possible next year and more in 2017 and beyond. 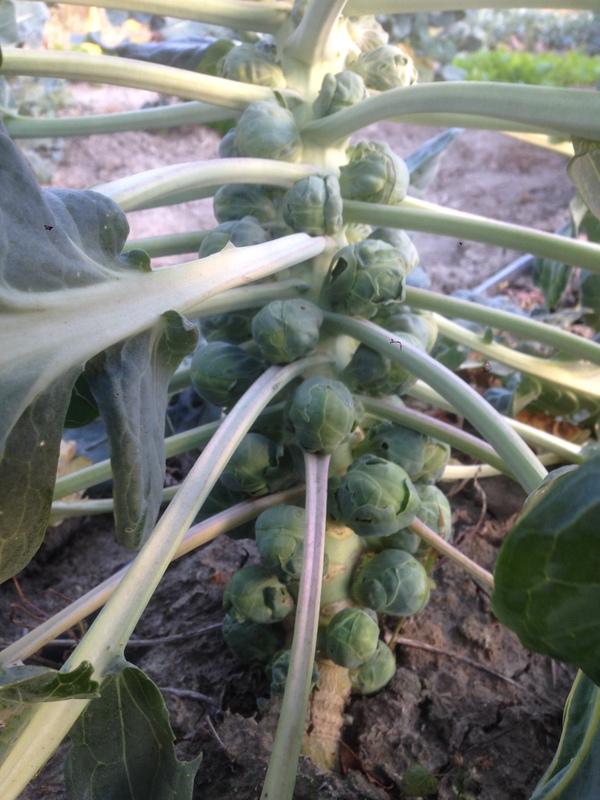 Also, a great response at the Indy Winter Farmers Market means our fall crop offerings will continue to expand. Look for savoy cabbage, black spanish radishes, four colors of carrots, dumpling squash, and cylindrical beets. 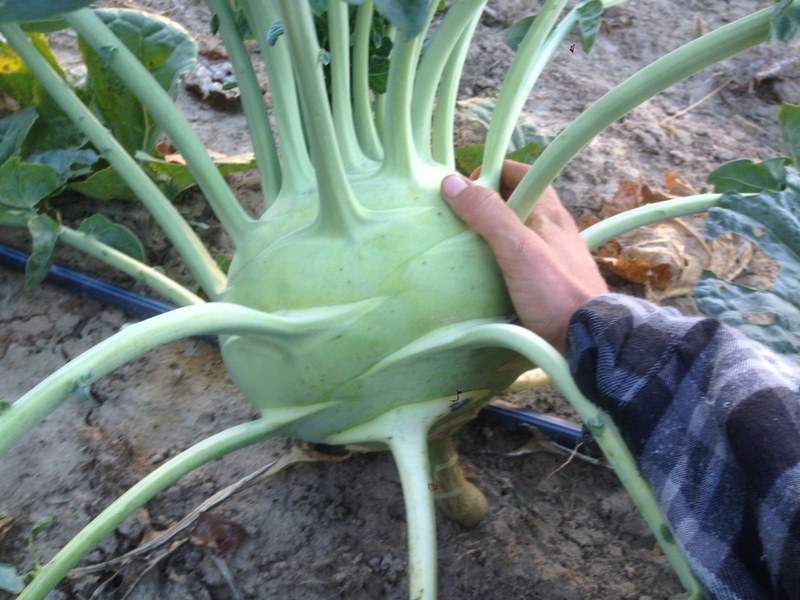 And more giant kohlrabi. We’re strongly considering adding an additional summer market, but have not yet chosen the market or the person to work the booth. If you have an opinion on the matter, let us know! In advance of some really cold weather, I harvested, washed, and packed all the celery. I’d always heard that celery was a “difficult” vegetable to grow, and I don’t personally love eating it. These two factors kept me from trying to grow any when I started expanding my vegetable operation. However, the need for a variety of veggies for the CSA got me to try it out. I think it was 2011 when I first gave it a shot. Like everything in the Apiaceous plant family (carrots, celery, dill, fennel, cilantro, parsley, and some others), celery does not tolerate weed competition. It is very slow to get started. It takes 8 – 12 weeks to get nice looking small transplants. It prefers consistent watering, good fertility, and doesn’t like hot temperatures. What I learned from my first celery crop was that if one or two of these things goes wrong, you get really, really bitter celery. 2011 was not as hot as 2012, but the celery still suffered. Some of it was edible, some was so bitter that even after cooking it I had to throw it out! Even when things are going right, Indiana celery, at least based on what I’ve seen on my farm and observed on others, is darker green and more intensely celery flavored than what you see in the grocery store. To allow celery to mature in cooler weather, I decided to move it later in the planting calendar and do it as a fall crop in 2013 and 2014. The results were favorable, especially this year. We’ve had a cool summer with above average rainfall and the celery really liked this. It tastes good and recent light frosts have given it a sweet undertone. A nice feature of celery is that it’s easy to harvest. One push with a wide blade knife (I use this one) and the plant is in hand. A little extra trimming in the field is often needed, unless there is a market for miniscule outer celery stalks. We trim off about 1/2 to 2/3 of the leaves, wash the whole thing, and pack it in a sealed container in our walk in cooler. Sometimes we use a rubber band, sometimes we don’t. The downside of field grown fall celery is that it needs to be harvested before really cold weather arrives. Temperatures below 28 F will make the stalks get softer and sort of rubbery. A very thin, papery “skin” will develop and will peel off the stalks, which is unattractive. We had a low of 19 F about a week ago. The difference between the celery that was covered and the celery that wasn’t is quite noticeable. You can still eat the stuff that got frozen, but it is noticeably flexible. Another project today was building a very low-tech low tunnel over the beets and carrots. The used greenhouse we put up in the spring came with about 100 pieces of 8′ galvanized electrical conduit. I think they were used for an irrigation system in their past life. We don’t do any overhead irrigating in our greenhouses, so the conduit has been sitting in a pile. Some time this summer it occurred to me that this conduit could be used to make low tunnels. We don’t have a pipe bender, and I was reluctant to shell out any money for one, so I took a look at my farm SUV and decided that I could either thread the pipe through the tow hooks and bend it, or thread it through the hitch receiver and bend it there. The tow hooks were really too far apart. The hitch receiver worked better, especially after we took off the spare tire. We put about 3 – 30 degree bends in each end of the pipe and pushed them into the ground by hand. I won’t win any awards for the consistency of my pipe bending with this method, but the job is done and all we have to do is throw some spare scraps of greenhouse plastic over the hoops before any more hard freezes. It’s been a good season so far. Cooler than average summer with plenty of rain makes for amazing fall vegetables. We have the nicest looking carrots, beets, daikon radish, and fall brassicas we’ve ever grown. Frosts will continue to improve the flavor. 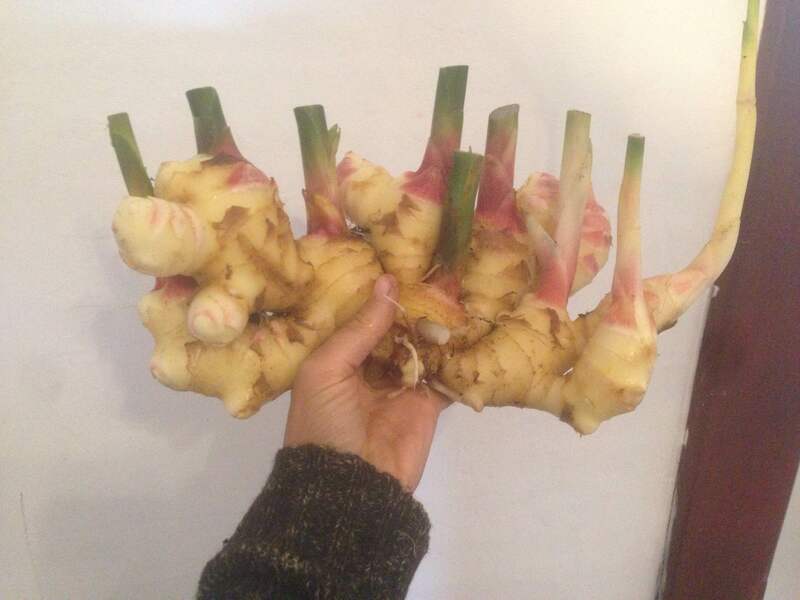 Our ginger harvest this year produced some really large “hands.” Here’s a photo of the largest one. All of our ginger was used this year by Fermenti Artisan and Raw Gourmet Delights in their amazing culinary creations. We’re excited to be joining the Indy Winter Farmers Market this year. I’ve visited in the past as a customer and thought, “Will we ever have enough winter stuff to join this market?” I’m glad we do. We’ll be there November 8th and 22nd, December 6th and 20th, and all of January, weather permitting.